Use the measurement that best represents your size. 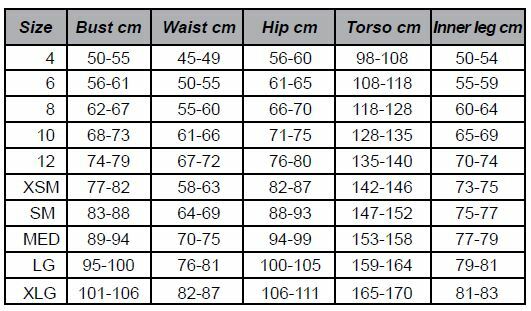 The waist measurement is the least important when choosing your size. PW uses a 4 way stretch Fabric and for best fit the garment needs to be a snug fit to the body and should not be loose. We do not recommend you go up a size to allow for growth as the Fabric will stretch with growth. 4. Torso: From right shoulder through the leg and back up to the right shoulder. Do not pull tape tight. 5. Inner Leg: From the crotch to 2.5cm above floor in bare feet. Our children’s sizes usually correspond to the child’s age. If it is for an average eight year old then a size 8 should fit. Usually you will go from a child’s size 12 to an adult small. The XSM is for the tall, slim child or petite adult. To get a perfect fit we do have sizing packs available for use for a limited time, or available for purchase. All garments are available in child sizes 4-12 and adult sizes Xsm-Xlg unless otherwise stated. If unsure of the size you require please contact us.